On the first Christmas the prophecy of Isaiah 9:6 was fulfilled. See how that first Christmas gives us joy and peace for today. 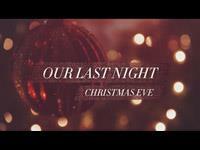 This video is great for evening candlelight services as well as regular Christmas services. Christmas Eve is our last night of separation. Our last night alone. For tomorrow, we would witness the birth of Glory. Tomorrow, God would be with us. Based on the scriptures John 1:1, John 1:9, and John 1:14.